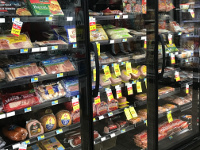 We have a wide selection of beef, pork, fish and chicken. Our meat is fresh and our prices are great. We are willing to serve you with special cuts - just ask. We also have the packaged meat you are looking for. Stop by today to explore our meat selection.